We recently celebrated our first child's birthday. 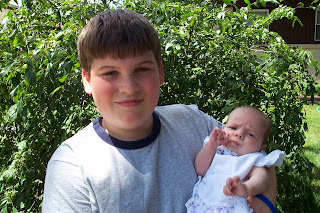 He's fourteen now. So much growing he has done in the past year. It's amazing how many changes a teenager goes through emotionally, physically, mentally and spiritually in just a short period of time. No wonder they have moments of turmoil. Brad is a brilliant, sensitive, and compassionate young man. At fourteen, he's making firm decisions for himself, is processing life with a more mature attitude and is such an encouragement to his family as we struggle through this journey we are on currently. We also have the honor of seeing the gentle side of his nature, of seeing him work out his own relationship with God and to make goals for himself for his future. One of the neatest aspects of our family unit is that even though our children have moments they scrap with each other, the relationships they have with each other goes beyond friendship. Brad's siblings really look up to him and respect him for who he is. They enjoy wrestling with him, sitting on his lap, following him around till he can no longer stand it. Brad is their go-to guy. We are so very proud of him, of who he has become and look forward to watching the rest unfold as he grows and changes. 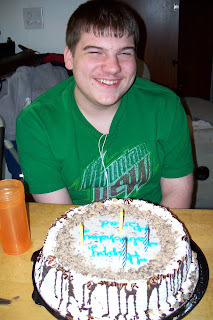 We celebrated this very special occasion with the cake of his choice, an ice cream cake from Dairy Queen. He had lunch with Grandma and requested hamburgers for dinner which he grilled himself. He did a fabulous job and is in high demand from heretofore to be our grilling man. This has been a pretty tough week. I just laughed as I wrote that because every week seems to be tough. How do you determine which is tougher or rougher than the other? Each has been unique in it's adventures that we've journeyed. This one though, has been tough emotionally. I've been able to maintain a pretty good outlook other than a few days here or there. However, this week I've been really battling despair. I'm sure it doesn't help that I've also been battling a nasty cold. When you are ill, you become pretty intolerant of the little things that are all around you. The little ones yelling that their toots smell like moldy cheese grates on your nerves a lot quicker, the neighbor kid knocking on your door to tell you that one of your kids sneezed on him tends to give you a twitch, and the people in your home seem to find all your nerves and purposely stand on them while seemingly enjoying it. You find that your smile is no longer attainable but instead, Dr. Frankenstein is rearing his ugly square head. I heard recently a little quote that seems to ring true. "Despair and discouragement are the quickest way to put yourself out of circulation." When you allow those things to leak in, it really does put a wedge in your communication with God, with those you love and with yourself. Satan just loves it when we knock our own selves out of whack. Makes his job much easier. His goal is to make us quite distracted and focused on ourselves so that we are useless to further God's kingdom. So here I am, despairing about where we are going to live, where we are going to store all our stuff, what are we going to do with this or how are we going to handle that and the weight of the whole situation just kept getting heavier and heavier till I felt I was suffocating. I don't react well when I feel like I'm a cat in a cage. Claws can be pretty devastating to those who stand in it's way. How do you get beyond all that frustration and discouragement is the question. Well...sometimes, it takes someone you love very dearly to help straighten you back around and to lovingly and firmly replant your feet in the right direction. Although, when this happens the hackles rise up and make me recoil at first thinking that perhaps it will be a long, long time before I ever have anything to say to him again but after pondering all that has been said, my heart seems to find it's way back home. I do believe that God knew we would need our mates not just to love us but to lovingly help us through tough times. God is the most important part of this equation. His word encourages me not to be anxious, to not worry about tomorrow, to trust in the shelter of His wings and that He will provide for our needs. It's when I try to take on the weight of our circumstances and try to carry it all, that I get myself into trouble. It's hard to wait on God's timing. I do believe that the waiting is one of the hardest things to do. I know that God has got this whole situation under control and that no matter where we end up and where our stuff ends up, that it will work out in the end. It's getting there that is the struggle. I'm just so thankful for God's abundant grace. I know that when I am at my weakest point, that God is waiting with open arms of love ready to embrace even the most wretched heart if we are willing to allow Him to do so. We received the notice from the court that the date was set for the eviction hearing. Friday was that day. We went and explained our situation and it was determined that they would give us 30 days. So we have to be moved out by the 13th of July. I have to admit that this whole situation is just heart breaking. I don't understand much of it. Why when we are able to connect with our neighbors for the first time in ten years now have to leave? 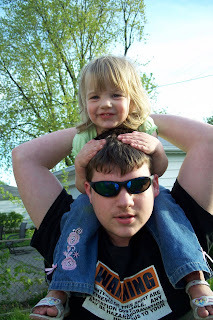 Why can't the doctors figure out what is going inside my husband's body so that he can get better and go back to work? The questions just go on and on. Much of why things happen are unexplainable but we are left with two options. We can either continue trusting in our Lord who tells us not to worry, to let tomorrow worry for itself or we can give up, turning our back on the One who has promised to give us what we need to face the day and all that is in it. We continue to praise, worship and serve the Lord. Serve Him as we've never served Him before. We choose to hang on to the promises that are in His word even in the face of fear, of being stripped of everything, of the unknown. He is our God and we will not turn our backs on Him. We feel an urgency to be a voice of hope. A voice that shouts the glory of God and speaks of His faithfulness. We will not be silent. It is extremely difficult to share the intimate details of our struggles with friends, with family and with those of you we haven't met but feel that God is calling us to do this. We feel very strongly that we need to encourage and to leave people with the hope that is in Christ. Even when life is falling apart around us, God has amazingly held us up and shown His love to us. He loves all of us so very much and His desire is to have a relationship with all of us. He wants us to have a faith that is real. A faith that goes beyond the physical agony. A faith that is pure and righteous through the saving grace of the Lord God Almighty. Many of you want to know what our 'plan' is but to be honest, we haven't any idea what that might be. It would be helpful in knowing what stuff to store, what stuff to give away but I just don't know. What I do know is that we need to box things up. Where the boxes are going is still up in the air. So our plan is this...we continue to trust God and seek Him for direction, for wisdom, for courage, for strength and that in His time, He will reveal to us what the plan is. Over the last few weeks, my husband has been through many rounds of blood tests and an ultrasound which have revealed absolutely nothing except that he has a bit of a fatty liver which will clear up as he looses weight. However, a fatty liver does not and is not the cause of the extreme pain that he is in. So we are back at square one without a clue as to what is going on. It's a vicious cycle when you are on medication. One of the side effects is weight gain plus the fact that he hurts so very badly that exercising is extremely difficult. The doctor changed one of the weight gaining medicines out for another which will help with the weight loss and he is just trying to endure the pain while exercising. In a normal situation, we try to do things to change the course of life. This, however, is one of those times when every avenue we've tried has had the door shut. All we have is to take what is before us, explore all options, and depend completely on God for His provision. He has been so faithful to provide. His promises are true as we've seen them worked out in our own lives. So we continue on....taking one day at a time relying on God's grace, His mercy, and His wisdom. We love to celebrate the accomplishments of our kids. Sometimes they are planned out and sometimes they come by surprise. This past week, our Ryan was out and about playing with his good friend next door like he usually does. Only this time, their dad was out playing around with the kids. 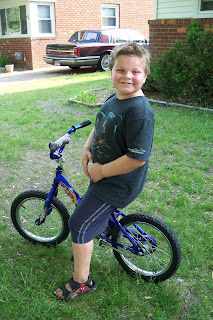 Ryan expressed an interest in riding his bike just like his good buddy Stephan was. Lo, and behold, after a couple tries of our neighbor giving him advice and helping him, off he went riding into the wind. Hi Ho Silver! I must admit I was a little sad that it wasn't Ryan's own dad helping him but right now, he isn't able to bend over like that to help him balance nor can he run along side of the bike. It made me a little sad and a bit mad. I guess I was having a selfish moment and after being slightly miffed and letting my poor husband know of my great disappointment, I had to swallow my words and admit that it wasn't about what I wanted but it was about the excitement of the moment for Ryan. So we watched with great enthusiasm at this wonderful accomplishment that our seven year old has conquered. After his riding adventures were done for the day, Ryan proudly walked into the livingroom and announced that we should have a party to celebrate him being able to ride his bike. I, teasing, asked him if we should make a cake. With the biggest grin you would ever be able to imagine, he answered with a yes! 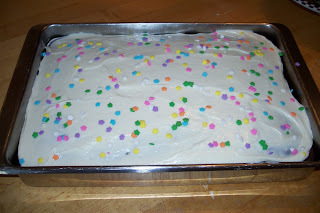 The first thing Ryan asked me this morning was when I was going to bake that cake. Aaron, of course, informed me we could not have cake without ice cream. God provided the ice cream and it was the perfect shade of rainbow colors which the boys announced looked like playdoh. I think they might have been more thrilled with the ice cream than the cake but it was a grand ol' celebration either way. The day has come. The day we've been expecting. But yet, the reality is excruciatingly agonizing. We received our notice from the court to start the eviction proceedings. It is tough facing all the emotions that come with it and even more so when they are coming from our children. I know that God is working through all this in my own heart and so I have to know that He is also working in my children's hearts as well. The word transformation and purification has been running through my heart for a few weeks now. Usually when that happens, God is bringing me through a revelation process. It's usually something He wants me to get a hold of in my head and in my heart. I was recently listening to a sermon and a phrase hit me hard. God is not interested in your temporary relief--He IS interested in permanent change. For example, our values, our heart condition, our purpose. So all these things that we agonize over and don't understand why they are happening are simply because without these struggles our growth spiritually is stunted and we remain shallow, baby Christians who need constant attention and are easily tossed in the wind. God is fiercely after our hearts and our relationship with Him. Have you ever had a shallow relationship? There is really nothing to hold on to and it easily slips through your fingers. God doesn't want that from us. So we must go through some tough stuff to strengthen that relationship, to change who we are in Christ...to be a better reflection of who Christ is. Of course, when the tough stuff happens, we've got to do our part and that is to hang on to God with all that is within us and open our heart to what He is teaching us. It's hard to fight our fleshly emotions. I have to fight all the time the thoughts that try to torment me like if God truly loved me, this wouldn't be happening or why is God punishing me. Those are wrong thoughts but yet, I wrestle with them. We have to remember that God fiercely loves us and if you have an understanding of the love you have for your child, then, you will then have a glimpse...just a glimpse of how God views His children. We also have to remember that Jesus Christ already paid the price for our sin so we are not being punished. There are always consequences to our choices and those consequences are what we must endure. We have to keep those things in right perspective. Even though my flesh is in agony and it's a scary road that we walk, I've seen the transformation in my own heart and in the lives of this family. We've gone through a purification process. We've been broken and liquified so that we now have a better understanding of our faith, of who God is, of our relationship with Him and truly what is important. It's a happy day when the little guys lose a tooth around here. It means that the tooth fairy is coming to town. The kids come to me often to show me a loose tooth or what they think is a loose tooth. Kara, whose three, keeps wanting me to check her teeth because she is sure they are all loose. Unfortunately, lately, the tooth fairy has been leaving I.O.U's instead of dollars. One time, the Grandma of the tooth fairy had to hook her up with a couple of dollars to meet the demand of the falling out of teeth in this family. It's a hard, hard job to keep this tooth fairy going. It's not like you can just recharge her battery so she keeps going and going and going, it's more like digging in the couch, looking in pockets, checking the laundry mug or on the dash of the car just to try to pull a dollar out of a hat. But that is all in the day and the life of a tooth fairy. The kids have only one complaint about the tooth fairy that comes to our home. Sometimes.....she forgets. So then, they have to try again the next night hoping she will remember. She has many teeth to attend to so sometimes it takes her a little bit to show up. Persistence is the key. You just keep that little tooth under your pillow and one day....one day very soon she will show up with that special little dollar and the lovely note she leaves with it. Don't lose hope. Then, they look up at me with those beautiful blue eyes while placing their hands on their hips and I hear the words....Mom, we know it's you. 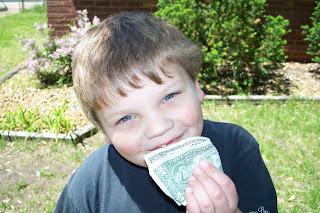 One cool little thing the younger ones haven't figured out yet is the recycled dollar. Once they figure this out, the tooth fairy is in big time trouble and she will probably have to come up with a way to smooth the waters. But for now, she's safe with a couple kids. When one of the younger children who had recently been visited by this lovely tooth fairy lady forgets about their dollar and a certain mother finds it amongst the toys or on the floor, she gives it to the tooth fairy to use again when a tooth falls out. Thus...the recycled dollar. It's a cost savings and it keeps the overhead low. Aaron recently lost a tooth, one of his front teeth. He excitedly ran down the stairs interestingly enough just after I had tucked him in for the night. My tooth fell out...my tooth fell out, he squealed with delight. So we put it in a baggie and placed it under his pillow. Well...the tooth fairy forgot. She kept reminding herself and reminding herself but she still went to bed without replacing the precious tooth with a note and a dollar. So in the morning as we were sitting at the table eating breakfast it dawned on her what she had once again done. She scrambled into the office to write a quick lovely note and scrounged to find a dollar which she is glad to report she had and ran up the stairs to do what tooth fairies do....leave it under a pillow. Upon her calm entrance to the kitchen, the tooth fairy disguised as a mother nonchalantly asked Aaron if he checked under his pillow this morning. With a frown, he sadly answered that he had and the tooth fairy was late again. His mother quietly suggested that maybe he should check again. Off he ran with speed and vigor, to check to see if maybe...just maybe his prize was there. The laughter and the happy boy noises that oozed from this five year old was something to be cherished. It's here...it's here he yelled as he showed me his note and his prize, a recycled dollar.